This journal's name has been changed. 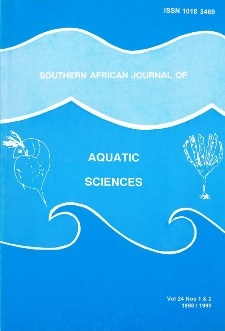 Contents of the Southern African Journal of Aquatic Sciences are available in the tab below, however the journals is currently known as the African Journal of Aquatic Science. THE EFFECT OF SEASON ON A BIOTIC WATER QUALITY INDEX: A CASE STUDY OF THE YELLOW JACKET AND MAZOWE RIVERS, ZIMBABWE. A NOTE ON THE REINTRODUCTION OF BARBUS TREURENSIS GROENEWALD 1958 (PISCES: CYPRINIDAE) INTO TIIE TREUR RIVER, MPUMALANGA, SOUTH AFRICA. THE BARRED MINNOWS (TELEOSTEI: CYPRINIDAE) OF ZIMBABWE: IS THERE CAUSE FOR CONCERN? Enter your details below to subscribe to Southern African Journal of Aquatic Sciences. Have a question about Southern African Journal of Aquatic Sciences? Call us on +27(0)46 622 9698 or submit an enquiry using the form.